The most robust pharmacy point-of-sale software on the market! This full-featured pharmacy specific POS software will give you everything you need to help you run your pharmacy more efficiently, while growing your customer base and increasing profits! 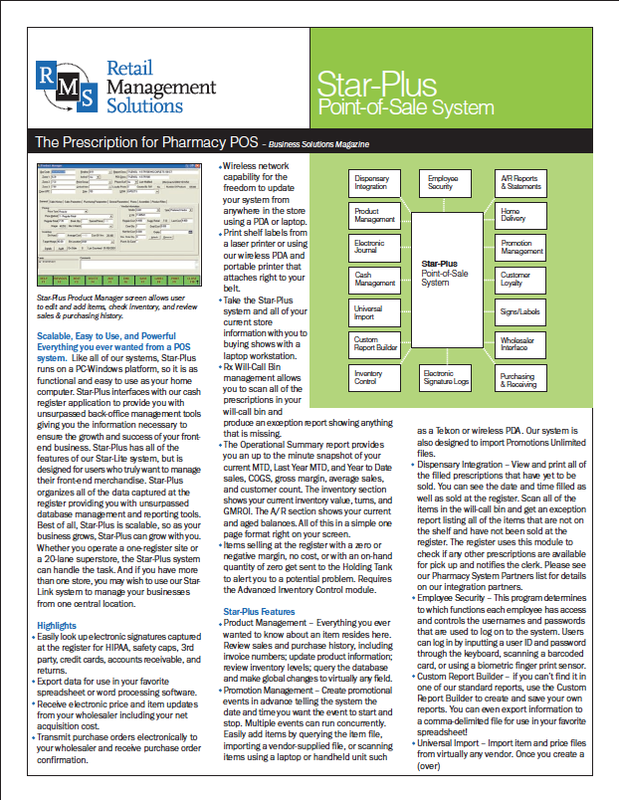 Business Solutions magazine referred called Star-Plus the "Prescription for Pharmacy POS." The Flexible Purchasing Order program allows Replenishment, Min/Max, and Scientific Purchasing (based on sales history). Easy to use and automated PO Receiving program allows user to "Receive by Exception". Inventory Control using FIFO or Average Costing. Import almost any product file with our Universal Import program. Export data to spreadsheet or word processing software. Receive electronic price and item updates from your wholesaler. Electronically transmit purchase orders to your wholesaler.